Stainless steel low pressure fan for corrosive fluids extraction, used to suction acid fumes, deriving from baths of a dyeing plant. Low pressure industrial centrifugal fan. Components in contact with the fluid are made of stainless steel AISI 304 L.
With mechanical seal on center bore. This fan is manufactured with parts in contact with the fluid made of micro-shot peened stainless steel AISI 304 L, to resist corrosion due to the passage of the fluid containing highly corrosive chemical agents and water vapour. WEG W22 IE2 2,2 kW 4 poles B3 V 230/400 50 Hz IP55. 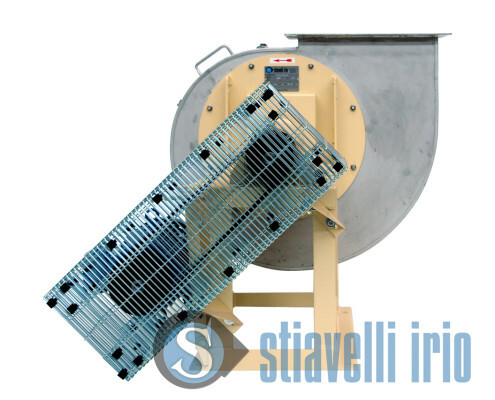 The fan is installed in a textile industry, to suction vapours deriving from the fabric dyeing process. We chose the belt drive solution to install a mechanical seal on the center bore, to prevent leakages and spills with presence of suctioned acid vapours, safeguarding the operators.